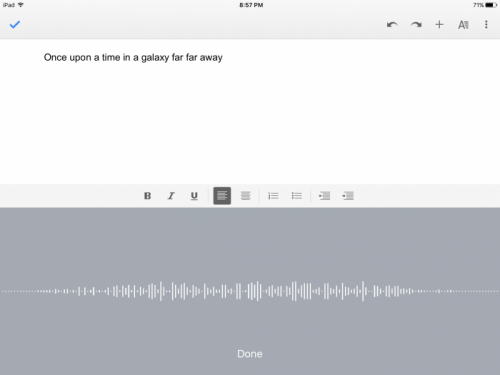 Skip the typing and start using your voice to write your documents. Learn more with this post! I don’t typically use Google Docs for word processing, but there’s one cool feature that might make you reconsider. It’s a dictation tool which uses Google’s voice recognition software. Best of all, it comes free with Google Docs, Sheets and Slides. No special plugin or anything like that. You have to enable “voice typing” in your Google Docs to use the dictation feature. To do this, open a document and go to the “Tools” menu. 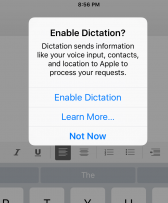 You should see a link for “Voice Typing…” and when selected, it will prompt you to enable dictation. Once enabled, you will see a microphone icon appear on your Google Doc if you are using a desktop or laptop. If you are using the app version of Google Docs on your Android or iPhone device, simply press the microphone button on your keyboard to use it. This is my first time ever using a dictation tool, so I don’t have much for a frame of reference. It seems very basic, but works great. It scribes as you speak, rather than waiting for you to speak, then taking 10 minutes to figure out what you said and scribe it on your Google Doc. One thing to keep in mind with dictation software is that it’s not going to insert proper punctuation into your document. For instance, if you were to say “Once upon a time, in a galaxy far, far away..” it would scribe it without inserting the commas. Instead, you have to mix commands into your writing such as “comma,” “period,” and “question mark.” The correct way to dictate this is to say “Once upon a time COMMA in a galaxy far COMMA far away PERIOD PERIOD PERIOD NEW PARAGRAPH.” Google Docs has a spell checker feature, but it doesn’t have a grammar or punctuation checker. As far as I can tell, there also isn’t yet a grammar checking tool as an extension or plugin. The dictation feature is available in Google Sheets and Google Slides, but it’s definitely more of a word processing tool. I don’t believe Microsoft Word offers a free dictation tool, but Google Docs also offers an extension which allows you to share your Google Doc file as a Microsoft Word document. A definite bonus! And good place to start your next document. I am a Project Manager and Scrum Master, and I also like to explore different tech ideas as a self-described 'Tech Galavant.' I have also authored a children's illustrated book series called "The Adventures of Sabrina," which all net proceeds go to charity.